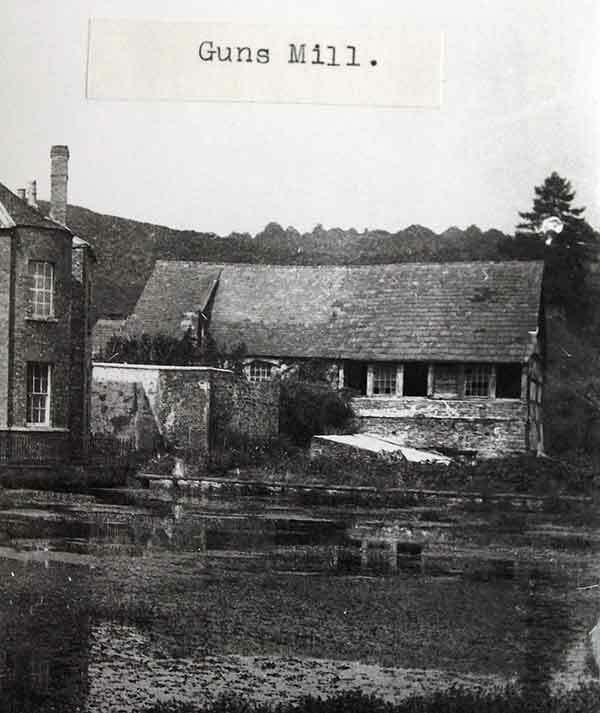 Gunns Mill is situated 2.6km north of Littledean in the Forest of Dean. When approaching from the south, the visitor today is met by a view of a huge block of plastic-shrouded scaffolding towering, underneath which (and depending on it for its very existence) are the remains of the oldest surviving blast furnace in the country. The site is designated as a Scheduled Monument and a Grade II* Listed building. 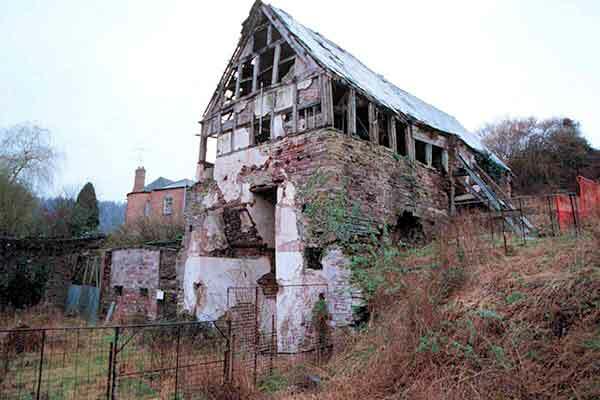 Furthermore, the site is on Historic England’s Heritage at Risk Register but has been rescued from the threat of extreme dereliction by the Forest of Dean Building Preservation Trust, who are undertaking a programme of conservation and restoration work to restore this unique building so that generations to come can continue to enjoy and understand it. 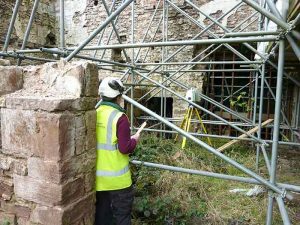 Our work at Gunns Mill completed a programme of drawn and photographic recording, which has been undertaken by a number of bodies using a variety of recording techniques over the last 25 years to support the important programme of conservation and renovation of the mill. 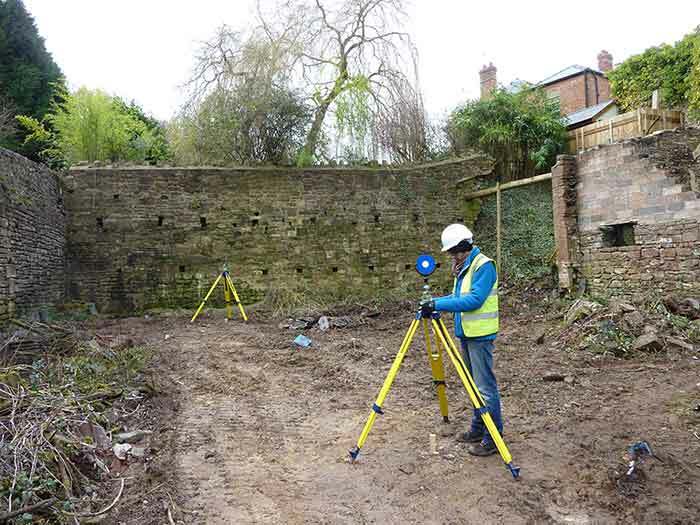 Cotswold Archaeology’s Built Heritage Consultant Peter Davenport provided the buildings analysis, while Jon Bennett and Rebecca Havard from our Geomatics team conducted the measured survey. Recording of below-ground remains associated with the mill was also undertaken by Cotswold Archaeology’s Fieldwork department. The mill was originally built as a blast furnace as early as 1683, and very probably before. This early date and the form of the blast furnace make it very significant as one of the most complete examples of an early blast furnace in the world. The mill represents a very visible reminder of the importance of the Forest of Dean in the early development of ironworking, both nationally and worldwide. In 1740 the furnace was converted into a paper mill and much altered. Between 1881 and 1982 the mill functioned as an ancillary building for a farm. Despite this, many features of the original blast furnace survive largely intact, including the charging house and blowing chamber. The furnace was built into the steep, southeast-facing slope of the valley of the Westbury Brook at Flaxley. To the west was a dam for a pond that fed a head race. Southeast of these structures was a broad level yard in a sunken area enclosed by retaining walls. The measured survey showcases some of the building survey techniques that Cotswold Archaeology has been adopting in recent years. The project presented a number of challenges due to the poor state of repair of the buildings, obstructed access, presence of scaffolding and periodically inclement weather conditions. The survey of the retaining walls, boundary walls and blowing house was undertaken in 2015 during two days of torrential rain. Luckily the waterproofing of the Leica P20 laser scanner used to make the record was up to the job: the survey team not so much! The P20 scanner is capable of scanning up to one million points per second with an inbuilt camera enabling the scans to be displayed in colour. Overlapping scans were made of the various structures and a network of tripods and targets were used to be able to join up the scans later. 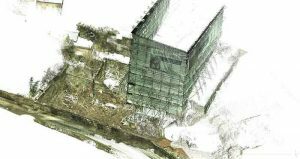 The scan data was processed, otherwise known as registering, using Leica Cyclone software from which a 3d point-cloud was generated. 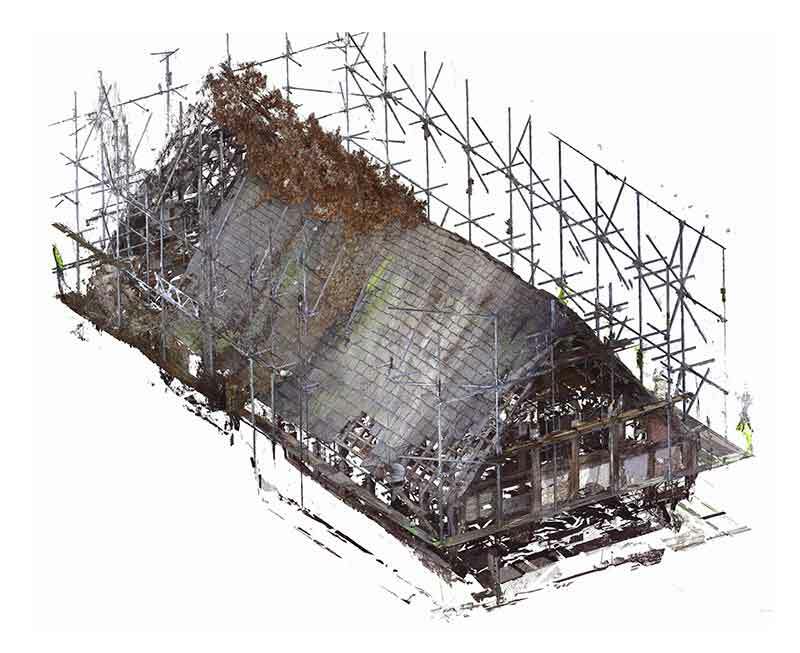 A point-cloud is a set of three-dimensional data points defined by X, Y, and Z co-ordinates taken across the external surface of the structures on the site. This can be used for drafting plans and elevations. A stone-by-stone drawing of the retaining walls was drafted in AutoCAD using the point cloud. Analysis identified numerous phases of building, rebuilding and changes in ground levels associated with the various uses of the site over time. A second phase of building survey and analysis, carried out in 2016, was concerned with the interior of the bridge house (a stone-and-timber structure above the blast furnace that once formed the charging house), the roof, the blowing chamber and the wheel pit. 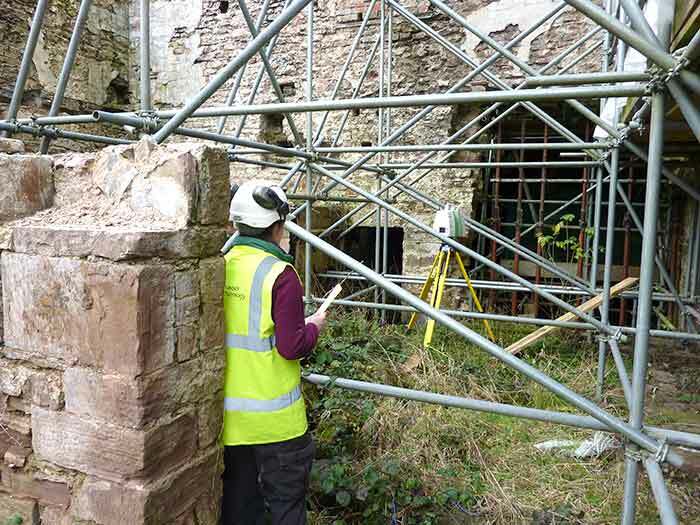 The interior of the bridge house was being held up with a network of scaffolding, which made the survey very difficult. 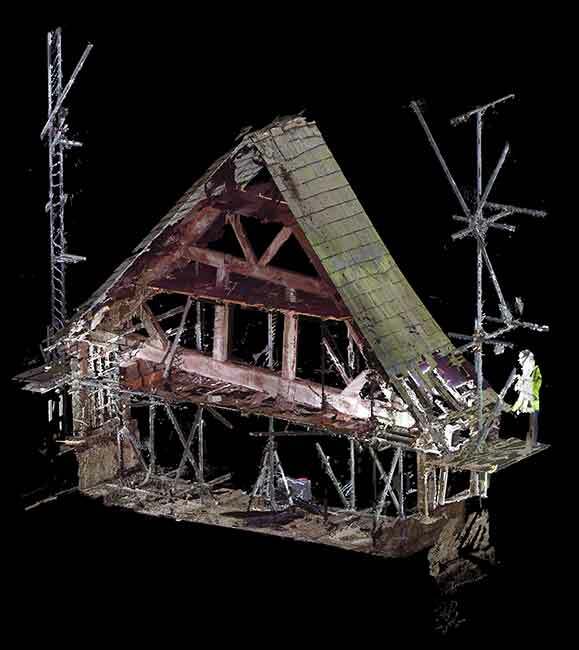 However, utilising a new model of scanner, the Faro X130, the team were able to scan the building in a relatively short space of time. The lightweight and compact chassis of the scanner made it ideal for moving around in a confined space. 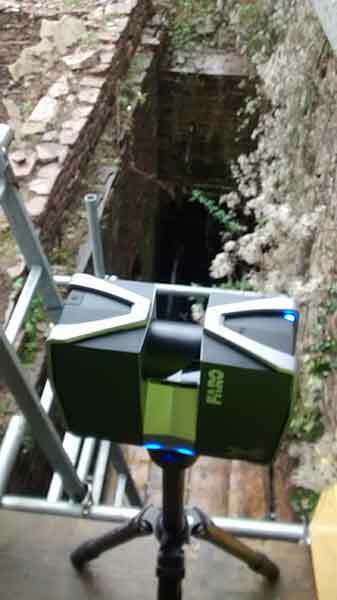 The Faro X130 allowed a different method for joining up the separate scans that were made of the structure. This time, instead of a network of tripods with targets, the scans could be registered together as long as they had a certain amount of overlap or like-points. This was further helped by positioning a number of ‘spheres’ in the scans to act as tie-in points. The scan data from the Faro was processed in Faro Scene from which a 3d point-cloud was generated that was again used in conjunction with AutoCAD to draft line drawings. The compact scanner also enabled the team to scan the wheel pit which would have been potentially very dangerous to survey, given its constrained access. The scanner was positioned on each level on the scaffolding to enable scanning of the wheel pit. Phased line drawings were again produced along with a typescript report detailing the various phases of the buildings. 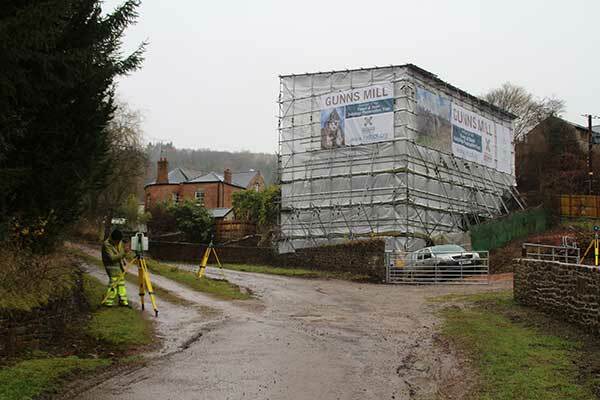 Cotswold Archaeology has produced two typescript reports detailing the results of the building survey and have also produced a significance statement detailing the importance of Gunns Mill in the understanding of early ironworking. These reports are available online through Cotswold Archaeology’s Online Reports. A report has also been published in Gloucestershire Archaeology’s Annual Review Glevensis.